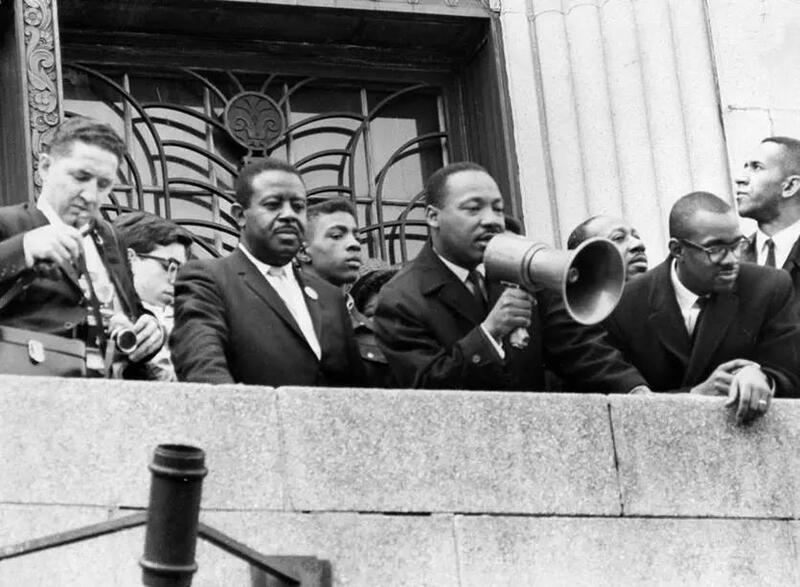 Martin Luther King, Jr. addressed a crowd at the Patrick Campbell School in Roxbury in 1965. That goes to the heart of why so many people of color in this country have been left behind. More than a half-century after King’s stirring speeches, this country continues to wrestle with racial and income inequality driven by the lack of economic opportunity. One of the most thought-provoking findings from the Globe Spotlight Team’s 2017 series on race was how a modern Boston managed to build a new neighborhood, the Seaport District, with billions of dollars in public funding, and yet still have the end product be a white, wealthy enclave — one that looks nothing like the diverse city Boston has become. How did this happen? In part, because blacks weren’t an integral part of the building boom. As the nation celebrates what would have been King’s 90th birthday, it’s fair to ask: Are we doing enough to take down the structural barriers to wealth? In particular, with so many cranes in the sky in Boston and so much money to be made, it’s fair to ask: Are we doing enough to ensure that development deals are inclusive? The Spotlight series highlighted a Massachusetts Port Authority policy that made the diversity of the development team one of the deciding factors in leasing land it owned in the Seaport. The result was something you rarely see in Boston: diverse teams of architects, investors, and builders coming together to bid on a project. While policies have been in place to address construction workforce diversity, never before had Massport prioritized the racial and gender make-up of development teams in evaluating proposals. So far the policy has been applied to two Seaport parcels — and the results are what Massport intended: Not only the creation of new local diverse partnerships but also interest from national minority-owned firms that now see Boston as a welcoming place to do business. Massport will roll out the policy on a third property this spring. But a single quasi-state agency alone can’t change the face of economic opportunity and wealth in Boston. Which raises the question: Where is the Commonwealth on introducing a similar diversity requirement? Currently, the concept is among the recommendations from the state’s black and Latino advisory commissions. Is this just another case of good ideas gathering dust? The Baker administration contends it has been working on a pilot program that it plans to launch over the next few months. Like Massport, the state owns land that it wants to lease out for private development, giving officials an opportunity to insist on diverse bidders. Let’s hope the administration goes through with the pilot and it doesn’t overthink a program that one of its agencies has had in place since 2016. Which brings us to the City of Boston. Last fall the city began requiring that all developers bidding for city-owned real estate disclose the diversity of their teams and said that would be a factor in determining the winning project. So far, the new requirement has been applied to four parcels in Dudley Square, and while the city is still reviewing proposals from developers, officials are pleased with the results so far: an array of local black and Latino-owned businesses bidding alongside national minority-owned firms. The city estimates the diversity requirement will be used on more than 2 million-square feet of land the city plans to sell or lease over the next several years, including its tow lot and other high-profile parcels in Charlestown and the Seaport. Inclusive development deals is just one tool — and shouldn’t be the only tool — to spread the wealth. A year ago, the Greater Boston Chamber of Commerce launched its Pacesetters Initiative so that members could diversify their supplier network. The result: Eleven members, including Fidelity Investments and Partners HealthCare, closed 13 deals that generated more than $3 million in new revenue for minority-owned businesses. Perhaps just as important is the creation of a pipeline of 68 minority suppliers that the chamber vetted as having the financial and operational capacity to service the buying needs of large Boston companies and institutions. Massachusetts is breaking down some of the barriers to wealth for people of color — but it’s fair to ask: What more can we do?